Snrky: I'm supporting paired programming in all its incarnations. I'm supporting paired programming in all its incarnations. We don't get political at Snarky very often, but we're based in Minnesota and our experience is with Minnesota developers and businesses. We're considered one of the more talent/creativity-driven economies in the US, and it's a combination of technology, talent, and tolerance that fuels that economy and economic diversity. Cheer(io)s to General Mills for recognizing that diversity is one of the many factors that powers our state and for stepping up to model tolerance. 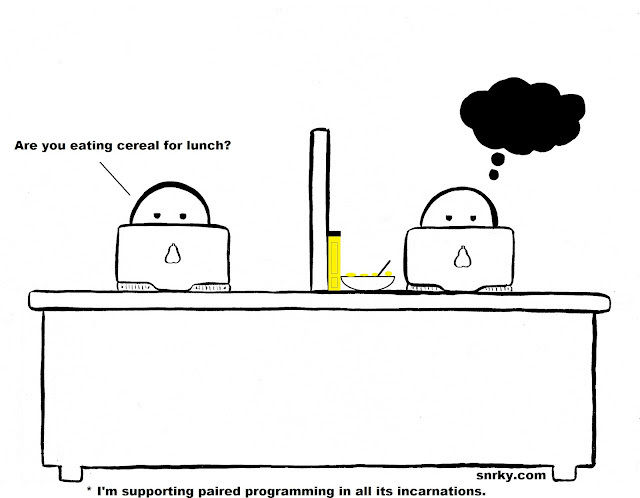 Snarky: Are you eating cereal for lunch?